If you think or dream of designing/developing software project, why you will think that project is always big .We can start project of minimal functionality rather than undertaking or thinking of a large project. You start with a small project, and should never expect it to get large. If you do, you will just over design and generally think it is more important than it likely is at that stage. Or worse, you might be scared away by the absolute size of the work you imagine. So start small, and think about the details. Don’t think about some big picture and great design. If it doesn’t solve some fairly immediate need, it’s almost certainly over-designed. And don’t expect people to fly in and help you. That’s not how these things work. You need to get something half-way useful first, and then others will feel confident on you and say, that “this almost works for me”, and they will get involved in the project automatically. Actually don’t try to be overconfident to finish application in one go. I still remember my academics when we were assigned with some programs of addition, subtraction.. Then gradually, we modified those small programs and made it functional as calculator program. I mean implement just one feature, and complete that. Then start another feature, and so forth. Otherwise, you will never get there. Apart, keep it clean, if at any stage your code gets a little disordered, refactor it before adding any more features. If you try and guess how you should try and modify the system for all future requirements, you're going to get everything wrong. Either you'll end up rewriting the code you never used, or you'll be stuck with code that sort-of does what you actually want it to do Apart, Copying and pasting text looks code in documentation part. I believe If you ever find yourself copy-and-pasting code, then that's a hint that you should pull out the common functionality of the code. You have worked with Microsoft visual studio any version. You are very familiar with classes. You have used .net framework classes. You can create a form in Microsoft® Visual Studio® .NET. You are familiar with relational databases and Microsoft ADO.NET. You have created a simple service in Microsoft® .NET. Regarding which they are always wondering and shy away from taking project initiative and trust me I have seen huge number of articles written by people without understanding the value of the layered or tiered approach to architecture. I know people love search engines because these search engines discover huge number of content which they are looking for but does anyone think whether the content is authentic? I am sure no one has time to think about it because they are looking for something which they get. What proper design pattern can I use here? What is the best way to structure my class hierarchy? What is the best way to reduce lines of code? If I have created separate layers, have I knotted them too much? Do I have a clean separation of code, like do I have a data access, business, Service & a UI layer? After you’ve defined the problem, have some draft of the UI, understand the business rules, have a basic idea of how the code is going to look, you may find yourself where I do need to ask the above questions. I am sure that you are thinking about how to address above questions to get your code done? The whole idea of cleaning up your code, using patterns is an art. Nobody is an expert at anything on their first attempt, their second attempt, etc.Simple more you study and practice and learn the better you will reach on level where you will feel comfortable with designing great applications. How This Article series is organized in Depth? Once the general requirements are gathered from the client, an analysis of the scope of the development should be determined and clearly stated. This is often called a scope document.Certain functionality may be out of scope of the project as a function of cost or as a result of unclear requirements at the start of development. If the development is done externally, this document can be considered a legal document so that if there are ever disputes, any ambiguity of what was promised to the client can be clarified. is the part of the process where software engineers actually program the code for the project. is an integral and important phase of the software development process. This part of the process ensures that defects are recognized as soon as possible. the internal design of software for the purpose of future maintenance and enhancement is done throughout development. This may also include the writing of an API, be it external or internal. The software engineering process chosen by the developing team will determine how much internal documentation (if any) is necessary. Plan-driven models (e.g., Waterfall) generally produce more documentation than Agile models. 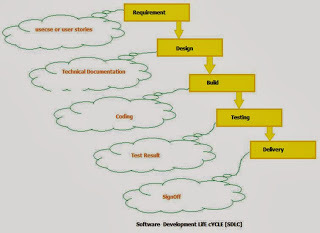 Software development process , also known as a software development life-cycle (SDLC), is a structure imposed on the development of a software product. Similar terms include software life cycle and software process. It is often considered a subset of systems development life cycle. There are several models for such processes, each describing approaches to a variety of tasks or activities that take place during the process. Some people consider a life-cycle model a more general term and a software development process a more specific term. 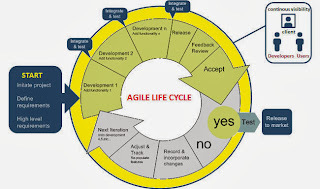 For example, there are many specific software development processes that 'fit' the spiral life-cycle model. ISO/IEC 12207 is an international standard for software life-cycle processes. It aims to be the standard that defines all the tasks required for developing and maintaining software. Requirement stage: - This stage takes basic business needs required for the project which is from a user perspective so this stage produces typical word documents with simple points or may be in a form of complicated use case documents. In this book we will be using use case documents to describe this stage. Design stage: - Use case document / requirement document is the input for this stage. Here we decide how to design the project technically and produce technical document which has Class diagram, pseudo code etc. Build stage:-This stage follows the technical documents as an input so code can be generated as an output by this stage. This is where the actual execution of the project takes place. Test stage:-Here testing is done on the source code produced by the build stage and final software is given a green flag. In this book we will have a test plan documents for this stage. Deliver stage: - After succeeding in Test stage the final Article /project is finally installed at client end for actual Articleion. This stage is start for the maintenance stage. Every activity has a life cycle and software development process too is an activity. Even if you are not aware of SDLC you still must be following it unknowingly. But if a software professional is aware about SDLC he can execute the project in a much controlled fashion. The greatest benefits of this awareness is that developers especially new developers will not start directly coding which can really lead to project running in an uncontrolled fashion. Second it helps customer and software professional to avoid confusion by anticipating the problems and issues before hand. 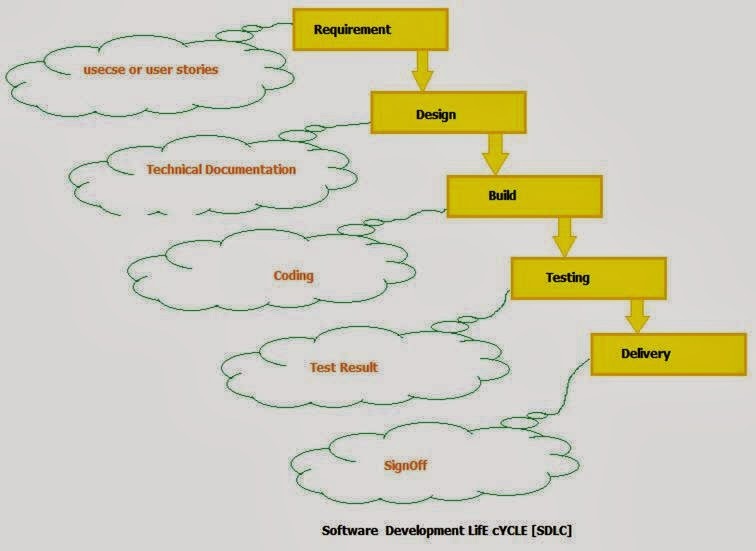 In short SDLC defines the various stages in a software life cycle. But before we try to understand what SDLC is all about. We need to get a broader view of the start and end of SDLC. 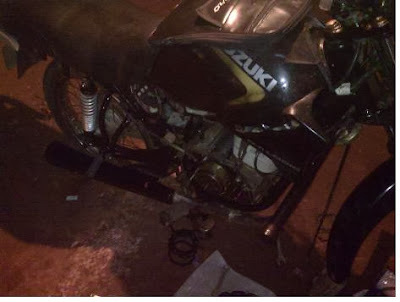 Any project started if it does not have a start and end then its already in trouble. It’s like if you go out for a drive you should know where to start and where to end or else you are moving around endlessly. Above is a more global view of the how the start and end of SDLC. Any project should have entry criteria and exit criteria. For instance a proper estimation document & requirement document can be an entry criteria condition. That means if you do not have a proper estimation document in place the project will not start. It can be more practical, if half payment is not received the project will not start. So there can be list of points which needs to be completed before a project starts. Finally there should be end of the project also which defines saying that this is when the project will end or sign off . For instance if all the test scenarios given by the end customer is completed that means the project is completed. In the above figure we have the entry criteria as an estimation document and exit criteria as a signed document by the end client saying the software is delivered. Below is the figure that shows typical flow in SDLC which has five main models .As per use developers can select model for their project. This stage takes basic business needs required for the project which is from a user perspective so this stage produces typical word documents with simple points or may be in a form of complicated use case documents. In this book we will be using use case documents to describe this stage. Use case document / requirement document is the input for this stage. Here we decide how to design the project technically and produce technical document which has Class diagram, pseudo code etc. This stage follows the technical documents as an input so code can be generated as an output by this stage. This is where the actual execution of the project takes place. Here testing is done on the source code produced by the build stage and final software is given a green flag. In this book we will have a test plan documents for this stage. After succeeding in Test stage the final Article /project is finally installed at client end for actual Articleion. This stage is start for the maintenance stage. In this model, it is assumed that all stages are freezed that means it’s a perfect world. But in actual projects such processes are impractical. In this model the project is divided into small chunks and delivered at intervals by different teams. In short, chunks are developed in parallel by different teams and get integrated in the final project. But the disadvantage of this model is there is improper planning may lead to fall of the project during integration or any mismatch of coordination between the team may cause huge failure. In this model work is break into parts like Waterfall model but the difference is that in Incremental model one team can work on one or many chunks which is contrasting from Waterfall model. This model uses series of prototype which refine on understanding of what we are actually going to deliver. 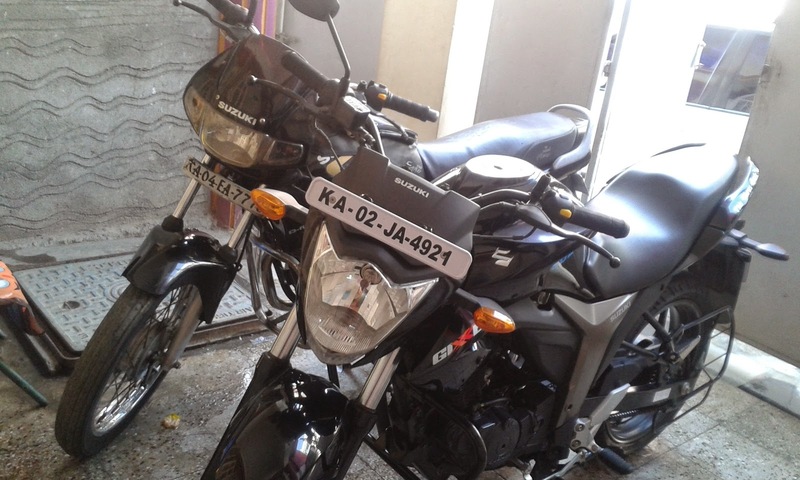 Plans are changed if required as per refining of the prototype. So every time in this model refining of prototype is done and again the whole process cycle is repeated. In Incremental and Spiral model the main problem is for any changes in between SDLC cycle we need to iterate through the whole new cycle. For instance, During the final(Deliver)stage client demands for change we retreat the whole cycle again that means we need to update all the previous (Requirement, Technical document s, Source code & Test plan) stages. In Evolutionary model, we divide software into small units which can be earlier delivered to the customer’s end which means we try to full fill the clients needs. In the later stages we evolve the software with new customers needs. Agile software development is based on fundamental changes to what we considered essential to software development ten years ago. The most brilliant programmer’s alive working competitively in an ego-rich environment can’t get as much done as ordinary programmers working cooperatively as a self disciplined and self-organizing team. You need a process where team empowerment and collaboration thrive to reach your full potential. The second change is making the customer, the one who funds the software development, a valuable and essential team member. When the dead line gets close a traditional approach to reducing scope is to let the developers decide what will work properly and what won't. Instead let the customer make scope decisions a little at a time throughout the project. When your customer or domain expert works directly with the development team everyone learns something new about the problem. True domain expertise and experience is essential to finding a simple, elegant, correct solution. A document can have plenty of information, but real knowledge is hard to put on paper. Left alone programmers must assume they know everything they need. When asking questions is difficult or slow the knowledge gap grows. The system will get built, but it won't solve the problem like one guided by an expert on a daily basis. Extreme Programming (XP) , the phases are carried out in extremely small (or "continuous") steps compared to the older, "batch" processes. The (intentionally incomplete) first pass through the steps might take a day or a week, rather than the months or years of each complete step in the Waterfall model. First, one writes automated tests, to provide concrete goals for development. Next is coding (by a pair of programmers), which is complete when all the tests pass, and the programmers can't think of any more tests that are needed. Design and architecture emerge out of refactoring, and come after coding. The same people who do the coding do design. (Only the last feature — merging design and code — is common to all the other agile processes.) The incomplete but functional system is deployed or demonstrated for (some subset of) the users (at least one of which is on the development team). At this point, the practitioners start again on writing tests for the next most important part of the system. Scrum is the most commonly used agile process. The results from the 7th Annual State of Agile Development Survey showed that 72% of respondents were practicing scrum or a variation in 2012. "Code and fix" development is not so much a deliberate strategy as an artifact of naïveté and schedule pressure on software developers. Without much of a design in the way, programmers immediately begin producing code. At some point, testing begins (often late in the development cycle), and the unavoidable bugs must then be fixed before the product can be shipped. 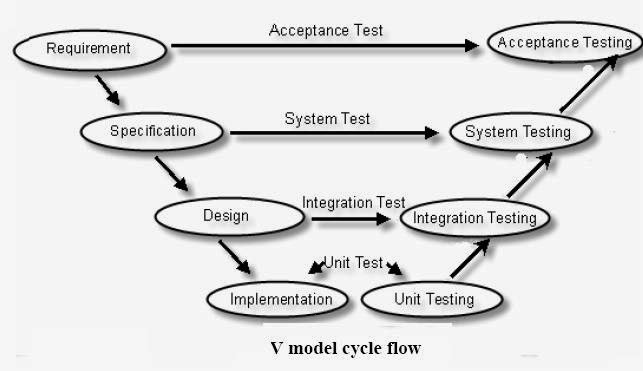 This type of model was developed by testers to emphasis the importance of early testing. In this model testers are involved from requirement stage itself. So below is the diagram which shows how for every stage some testing activity is done to ensure that the project is moving as planned. For instance, In requirement stage we have acceptance test documents created by the testers. Acceptance test document outlines that if these test pass then customer will accept the software. In specification stage testers create the system test document. In the coming section system testing is explained in more elaborate fashion. In design stage we have integration documents created by the testers. 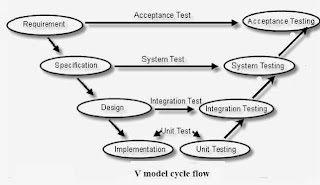 Integration test documents define testing steps of how the components should work when integrated. For instance you develop a customer class and Article class. You have tested the customer class and the Article class individually. But in practical scenario the customer class will interact with the Article class. So you also need to test is the customer class interacting with Article class properly. In implement stage we have unit documents created by the programmers or testers. Let’s try to understand every testing phase in more detail. Unit Testing: Starting from the bottom the first test level is "Unit Testing". It involves checking that each feature specified in the "Component Design" has been implemented in the component. In theory an independent tester should do this, but in practice the developer usually does it, as they are the only people who understand how a component works. The problem with a component is that it performs only a small part of the functionality of a system, and it relies on co-operating with other parts of the system, which may not have been built yet. To overcome this, the developer either builds, or uses special software to trick the component into believe it is working in a fully functional system. Integration Testing: As the components are constructed and tested they are then linked together to check if they work with each other. It is a fact that two components that have passed all their tests, when connected to each other produce one new component full of faults. These tests can be done by specialists, or by the developers. Integration Testing is not focused on what the components are doing but on how they communicate with each other, as specified in the "System Design". The "System Design" defines relationships between components. The tests are organized to check all the interfaces, until all the components have been built and interfaced to each other producing the whole system. System Testing: Once the entire system has been built then it has to be tested against the "System Specification" to check if it delivers the features required. It is still developer focused, although specialist developers known as systems testers are normally employed to do it. In essence System Testing is not about checking the individual parts of the design, but about checking the system as a whole. In fact it is one giant component. Systems testing checks that the system that was specified has been delivered. Acceptance Testing checks that the system will deliver what was requested. The customer should always do acceptance testing and not the developer. The customer knows what is required from the system to achieve value in the business and is the only person qualified to make that judgment. This testing is more of getting the answer for whether is the software delivered as defined by the customer. It’s like getting a green flag from the customer that the software is up to the expectation and ready to be used. In the previous section we looked through all the models. But in real projects, hardly one complete model can full fill the entire project requirement. In real projects, tailor model are proven to be the best because they share features from all models such as Waterfall, Iterative, Evolutionary models etc and can fit in to real life time projects. Tailor model are most Articleive and benefited for many organization. I am going to rely on Big Bang Waterfall model. In waterfall project output of every stage will be freezed as explained earlier no changes will be accepted once the requirement document is freezed. What ever model you fallow, they are almost same in terms of phases you work with .Truth is that Choosing model is demand from client or sometimes taste. There is different documentation for every project and these documents change from organization to organization and obviously project to project.For instance, some organization will have 3 documents and some will have 12 documents in a project depending upon project manager or the policy of the organization to execute a project. Requirement document:- requirement document can be a single English document, probably a recorded audio or video conversation or can be a complicated use case. In short it’s something raw which comes from the end client. Estimation document: - After getting requirement from the user we can judge cost for the project. In this book we will be using the function point estimation model. There is a complete chapter which is dedicated to function point in this book. Technical document:- This document contains detail of how the project being executed such as pseudo code, class diagram, objects diagram, etc. Test result document: - This document is written by the testers which describe the test plan which needs to be executed and thus giving project a green flag to Articleion. Source code: - This is not basically a document but one of the important deliverable which maps to the execution phase of SDLC cycle. They are used to show static structure of an application. Let’s try to understand what word static means here. For example a civil Engg makes a model of a building. The outer structure of the building will remain same but inner part of the building for instance the structure of rooms and passages (one room, two rooms etc) can vary. Same holds true when we talk about software industry there are static part and dynamic part of project. For example classes in project will rarely change. Yes the attributes and methods in the class will change as user adds new functionalities. For instance in the below figure you can see the Invoice header will have multiple invoice details. The structure and relation between Invoice header and Invoice detail will never change. But yes the invoice can pass through multiple stages like open invoice, closed invoice or pending invoice which is dynamic. UML gives us five Behavior diagram. They are used to show dynamic structure of an application. Let’s try to understand what does a dynamic structure of a project means. In a typical software project we can have business validations. Business validations of a project are of very dynamic nature. For instance an invoice can have lot of states for instance open invoice, closed invoice and paid invoice. And your software will change the invoice object from one state to other state. This is a dynamic nature of the project. The above figure shows how the invoice section moves dynamically by making transition from one state to other state. In UML to represent this kind of dynamic nature there are five diagrams. Model management diagram gives a view how different application modules are managed, grouped and classified. For instance the below figure shows how Accounting, Payment and common routines are grouped and organized. Deployment diagram Use to show the run-time architecture of the system, the hardware platforms, software artifacts (deliverable or running software items), and software environments (like operating systems and virtual machines). Primary Actor:-This actor actually initiates the use case on the system. Secondary Actor:-While Secondary Actor contacts other actors or use cases to meet the Primary Actor’s goal. The examples used in this topic relate to a Web site on which customers can order meals from local restaurants. An actor (1) is a class of person, organization, device, or external software component that interacts with your system. Example actors are Customer , Restaurant , Temperature Sensor , Credit Card Authorizer. A use case (2) represents the actions that are performed by one or more actors in the pursuit of a particular goal. Example use cases are Order Meal , Update Menu , Process Payment . On a use case diagram, use cases are associated (3) with the actors that perform them. In every project we have use case documents as a part of requirement gathering. So once you go through those use case you will have good understanding of the same. You should use sequence diagrams when you want to look at the behavior of several objects within a single use case. Sequence diagrams are good at showing collaborations among the objects. They are not so good at precise dentition of behaviour. Process Overview The Open a New Account process is initiated in the User Services Layer (USL). A user inputs his or her first name, last name, password, and e-mail address. After the USL validates the information through validator controls, it passes the information to the Business Logic Layer (BLL) via the FMStocks7.BLL.Account.Add method of the Account object. The BLL then passes the information to the Data Access Layer's (DAL) AccountAdd object. The DAL then calls the Account_Add stored procedure (SPROC) in the SQL Server database. If the SPROC is successful, it adds the information to the accounts table. Otherwise, it returns to the Open a New Account page and the process is repeated. Upon successfully adding a new record to the accounts database, the Generic Accounting Module (GAM) object additionally creates an account with a cash balance of US$10,000.00; this is all done in a distributed transaction. The user is then redirected to the login page and the E-Mail field is filled in. that we would use a second flow of events for the case where the user is not authenticated. So for the same we need to document it using use case documents which is explained in the coming section. In the next section we will go through a use case template which we will use in most of the project. Use case templates can be used to expand on the above diagram in more detailed way. Below is the use case template which we will be using in most of our project. So let’s understand every section of the template. How do Interaction Diagrams help? A web-based system is an example of a 3-tier client-server web architecture with a presentation layer, a business logic layer, and a database layer. The business logic layer is the IIS web server with server-side processing using ASP (VBScript) and the database server supporting T-SQL. a database server supporting SQL (Structured Query Language). We can now improve our sequence diagram to the following using a UML sequence diagram. The steps are summarized here as the following flow of events. The web browser requests the login page from the web server. The web browser displays the login page to the user. The user inputs the login form. The user clicks on the login button. The web browser validates the information supplied by the user. The web browser submits the login form to the web server. The database server requests the relevant data from the database. The relevant data is returned from the database. The database server/windows Active directory uses this data to authenticate the user and send the result to the web server. The web server sends the page to the web browser. 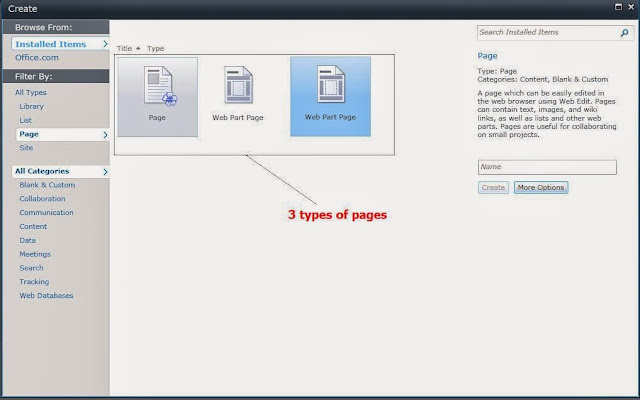 The web browser displays the landing page to the user. Class name:- This is the first section or top most section of the Class which represents the name of the Class (Article). Attributes:- This is the second section or the middle section of the class which represents the properties of the system. Methods: - This section carries operation or method to act on the attributes. going to be used by Article class to show Article with comments. The left to right marked arrow basically shows the flow that comment class uses the Article class. In this Association there are two types mainly Aggregation Association and Composition Association. Aggregation Association signifies that the whole object can exist without the Aggregated Object. For example in the below figure we have three classes university class, department class and the Professor Class. The university cannot exist without department which means that university will be closed as the department is closed. In other words lifetime of the university depend on the lifetime of department. In the same figure we have defined second Association between the department and the Professor. In this case, if the professor leaves the department still the department continues in other words department is not dependent on the professor this is called as Composition Association. The filled diamond represents the aggregation and the empty diamond represents the composition. You can see the figure below for more details. When we try to show Aggregation and Composition discusses above in a complete project the diagram becomes very problematical and very complex so in order to keep it simple and visible we can use Composite structure diagram. In many scenarios you need to show that two instances of the same class are associated with each other and this scenario is termed as Reflexive Association. In Generalization and Specialization we define the parent-child relationship between the classes. In many instance you will see some of the classes have same properties and operation these classes are called super class and later you can inherit from super class and make sub classes which have their own custom properties. In the below figure there are three classes to show Generalization and Specialization relationship. All phone types have phone number as a generalized property but depending upon landline or mobile you can have wired or simcard connectivity as specialized property. In this diagram the clsphone represent Generalization whereas clslandline and clsmobile represents specialization. Sometime I believe that it is hard for one to estimate unless and until you do a fine grained analysis of the system. It's one thing to estimate effort as opposed to time. Effort calculations can be more transitive across teams as they estimate things on basis of components, function points, lines of code, modules, screens, etc. For me I believe unless you're keeping a record of time spent on previous projects, how can you expect to estimate future ones? I personally recommend just decide on an effort metric and you continue to track your time spent developing solutions next to it. The success of every project is keep testing….. the current project which I am doing along with this series have simple test plan. Below is the simple paste of a sample. This is basically an Article gallery application. The below action is when user updates the Article details. So basically we define steps with pass and failed conditions. Select one of the article from the article data grid. Article details will be displayed on the textboxes. Modify some information in all the three fields. System should save the changed information and display the newly entered data in the grid. Failed condition: The system is not able to update the address data.